Hello, July! It took a long time for summer to come to northern Norway, but by mid-June Tromsø was finally fully green again, with wildflowers growing out of every nook and cranny they could squeeze themselves into. The rare warm, sunny days here are such an incredibly special treat, and I’m grateful to have enjoyed a few of them (in between the more frequent chilly, grey, and rainy ones). With those warm summer days in mind, I had a recipe published last month in the Norwegian American for chilled overnight oats. I love oats, and berries are one of my favorite things about summer, but when the apartment gets warm on sunny mornings, I can’t do warm oatmeal. Enter overnight oats – served cool, I love the fact that I can just pull them out of the fridge in the morning and the only prep needed is to add whatever topping you like. 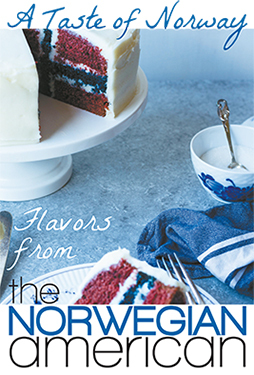 The recipe can be found over on the Norwegian American’s website! In the meantime, it will probably continue to stay quiet here for a little while longer – I’ve finished my degree and we are preparing to leave Norway by the end of the summer. It’s a bittersweet parting, but more on that later! If you’ve been reading this blog for a little while, you may know that I occasionally contribute recipes to the Taste of Norway section of the Norwegian American, a bi-weekly paper based out of Seattle that is America’s only remaining Norwegian-American newspaper. This paper has been published continuously (under a few different names over time) since 1889, and now they need our help. If you, like me, are interested in cultural heritage and Scandinavian-American culture, I hope you’ll read on. If you’re unfamiliar with the paper, you can read a little bit about it on their about page, or if you’re interested in a more detailed historical overview (I’m a nerd, you guys – I love this stuff) you can check out the Wikipedia page for the Norwegian American. What the paper is doing these days is relevant and interesting, and if you think so too, I hope you’ll consider contributing to their Indiegogo campaign, which runs for two more weeks. This fundraiser is intended to help cover operating costs not being met by subscriptions and advertising revenue alone. You can contribute as much or as little as you like, and there are a diverse array of perks to choose from based on your donation level. And finally – this is where I come in! There are, of course, many other kinds of perks (I’ve got one of those waffle bandanas and a set of vintage reproduction postcards lined up for myself) which you can peruse at your leisure. As the fundraising campaign runs for 14 more days, perhaps you might make a donation in honor of syttende mai, Norway’s national holiday happening next week? There’s a long way to go yet (we’re sitting at 44% of our goal) so we’d love your help. If you’re unable to financially contribute at this time, you can still help us out by spreading the news, or by following the Norwegian American on Facebook or Twitter. And just to get you in the spirit, I’ll close with this photo from May 17 two years ago, when I watched the parade in Ballard (in Seattle, Washington) with my friends Christy and Kelsey, two of the past editors of the Norwegian American. We hope you’ll support the fundraiser! I turn in my thesis next week (before syttende mai, fortunately), so we’ll soon be back to regularly scheduled sporadic posts about Nordic baking. Thanks for indulging a little plea for help for a paper I love in the meantime! I got a bit behind with things last fall; I had two recipes published in the Norwegian American Weekly’s Taste of Norway and I never made time to mention them here. Better late than never! In September we were right in the middle of autumn in Tromsø, and it felt like a great time to do a Nordic take on the classic grilled cheese & tomato soup combo. Norway isn’t known for its amazing tomatoes, however, so I did my grilled cheese on rye bread and paired it with potato leek soup. This has been one of my favorite meals all through winter. You can find the recipe here. 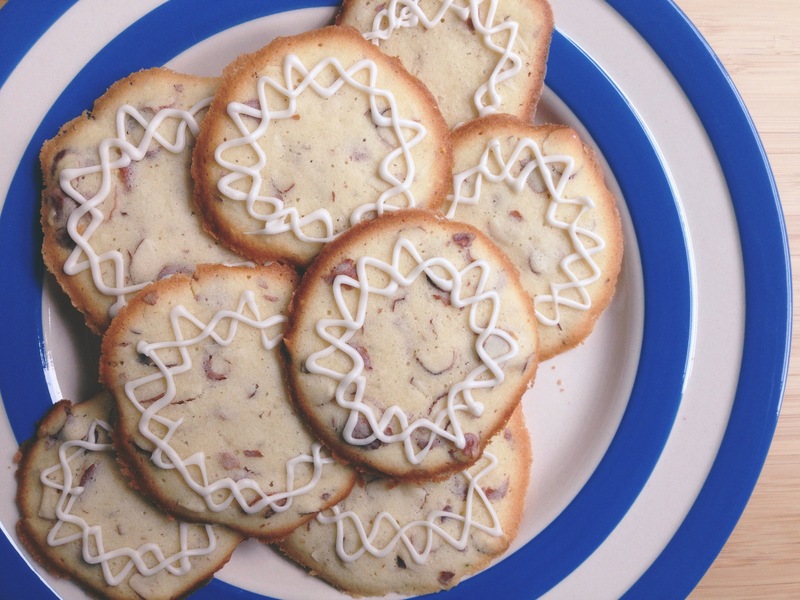 In November I did a cookie recipe on the heels of the paper’s craft month, which was October. They’re simple spritz cookies but the decoration packs a punch: sprinkles are used to recall traditional patterns from embroidery and knitting. I had a lot of fun making these. Find the recipe here. Hi, hello! I have a couple of pieces of news today! I’m very pleased to share that I’m one of several new contributors to the Norwegian American Weekly‘s food section, Taste of Norway. I’m incredibly grateful to the food editor Daytona (of Outside Oslo) for giving me a chance to be included, for I do love writing about food. Unlike this blog, I’ll be contributing actual recipes; much like this blog, I’ll be writing rather conversationally in my own voice and taking my own photos. My first recipe for the paper is in this week’s issue (the June 5th issue) and can be found online here. I’ve come up with an almond cookie recipe with celebratory occasions in mind: the kransekake provided some inspiration, and the recipe itself is based on one of Ojakangas’s that I’ve made several times, unsurprisingly (though I’ve made several changes to suit my taste). At this point I’ll most likely only be contributing every couple of months or so, so I’ll post here whenever I have a new story/recipe up. This piece of news is one of two things I’m hoping will help revitalize this blog, as well. The other piece of news is something I made passing reference to in my last post – I’m moving to Tromsø, Norway this summer to begin a master’s program at the University of Tromsø in the fall. I wrote about that decision on my other blog, but needless to say, I’m incredibly excited. One of the things I’m hoping to bring into my pieces for the Weekly when I can is my experience with exploring food culture in Tromsø. I am really only a fledgling cook, but eating out in Norway is very expensive, and I’m hoping this will be a motivator to do a lot more cooking in the kitchen (particularly when there are so many wonderful Nordic cookbooks coming out at the moment). 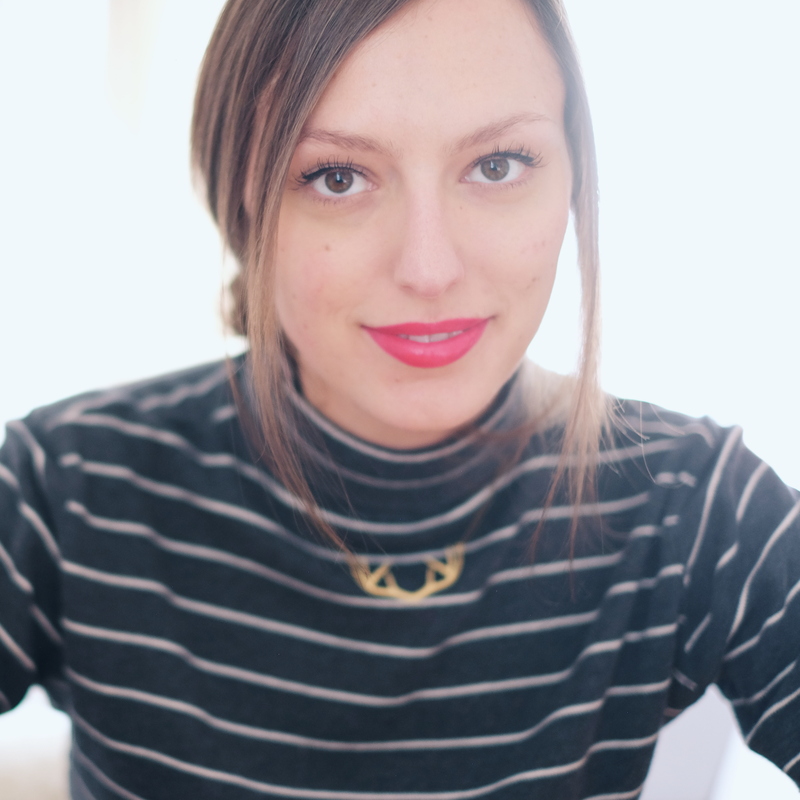 I’ve also been thinking about ways to keep this blog going a little bit more… regularly. It wasn’t started with the intention of being a regularly active blog, necessarily, more just a place to document what I baked out of The Great Scandinavian Baking Book, but in the nearly five years (what?!) since I started this blog, my Nordic horizons have expanded quite a lot. I’ve actively worked on my Norwegian, I visited Denmark and Sweden for the first time, I visited Norway and Iceland for the first time (and then went back, and then went back again, and again, and…). I fell in love with the Norwegian coffee scene. I started actually reading quite a few more food blogs. And then there are the new Nordic cookbooks, coffee books, and baking books that are coming out… I’ve picked up a few and found myself itching to write about them – and really, what better place is there than this? There was a time where I was unlikely to bake anything Nordic that wasn’t from Beatrice’s book, but that time has definitely passed (and in fact I think it passed a few years ago, which is why this blog has seen so few posts in the last year or two). It seems to follow that starting to include other sources in this blog makes perfect sense, and so I plan to do that bit by bit. In the meantime, be sure to check out the Taste of Norway section in the Norwegian American Weekly – I think the quality of the stuff Daytona has brought in is really excellent and it’s so exciting to see the whole section revitalized.